The opportunity for internet businesses is huge, considering the fact that the size of the Indian internet economy is $30 billion. This is small when you compare it with the size of the digitial economy in the US and China. 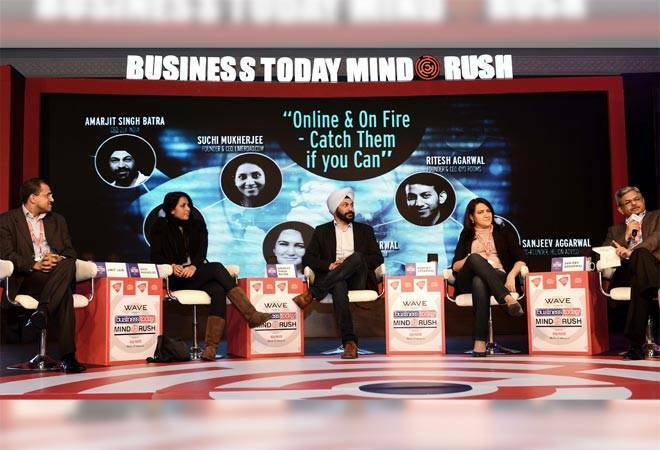 "But the comparison tells you that the internet story is just being started, hasn't played out yet, as perceived by some," said Sanjeev Aggarwal, co-founder at venture firm Helion Advisors, at the BT event MindRush. Commenting further on the market opportunity in India, Radhika Aggarwal, co-founder and Chief Business Officer, ShopClues.com said, "We have just scratched the surface." She shared the story of ShopClues which started in 2011 at a time when Flipkart ruled the ecommerce market. ShopClues was designed to be more like a local bazaar wherein local sellers could sell their stuff. With 300,000 sellers on the ShopClues platform, growth has been immense. Limeroad Founder and CEO, Suchi Mukherjee delved on the opportunity beyond market size and said that the huge difference in between retail prices and manufacturing costs allows for a lot of disruption. Limeroad is doing that by allowing discovery of products on the site through user-generated content. "There is an infinite stream of product-discovery on Limeroad, something that perfectly suits the palate of women lifestyle buyers," she said. For others like Uber, there is a opportunity to create an impact on people's lives, specially its driver partners. "The vision is to make transportation available to every one just like water and electricity," said Amit Jain, President, Uber India. "The value proposition to riders in India we have about 250,000 driver partners in India and we are offering them a fundamental difference to their lifestyle by helping them earn more and providing them the flexibility of entrepreneurship. We are also trying to solve problems of road congestion and pollution by using technology," he said. However, with all the hype around such businesses raising huge rounds of investment at skyhigh valuations, Sanjeev at Helion raised concerns of sustainability of such businesses which are driven by high cash burn. "Will the wheels come off," was the mute question to all entrepreneurs on panel. Panelists offered some justification to burning huge amounts of cash to lure consumers into buying online. "It is imperative to make it easy for consumer to change their lifestyle. This is what discounting did for the first two to three years. But now investors are asking when do we get to profitability. That's a question that will be answered soon," said Radhika. Suchi, commenting on sustainability, said, "It is important to give the consumer a hook that is sustainable. You have to create something that fundamentally solves a problem for a user for a lifetime. Create something that is phenomenally disruptive," she said. However, Suchi also agreed that capital has been easier to come for ecommerce than other businesses. "Initially the burn is higher because of the cost of capital is lower. Cheap capital does make you a little bit lazier. Yes we did burnt capital to accelerate the rate of growth. Your propositon needs to be sticky enough for users to come back." Sanjeev said that the practice of losing money to become monopolies is being dealt by investors across the globe and the trend is not specific to India. Sanjeev also brought up the issue of local players competing hard with global players in the Indian market. Uber's Amit Jain said, "You've got to be a local company to understand the environment. Companies are becoming better and better at adapting to local conditions. We are in 67 countries. Technology and processes come to our aid." "Who is going to come and disrupt us?" said Radhika. "When we invest, we see two things, we see the horse which is the market that you are trying to disrupt and the jockey which is the entrpreneurs," was Sanjeev's response. "No one can answer where disruption will come from."